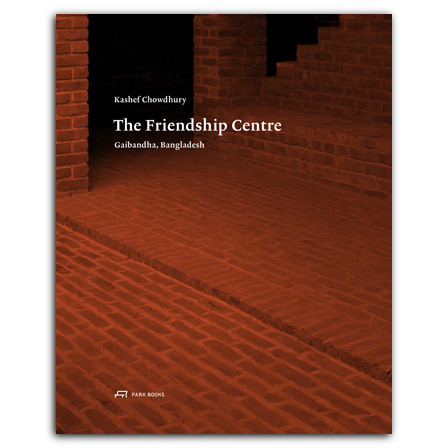 The Friendship Centre in Gaibandha, Bangladesh, was built for the local NGO Friendship, which provides services for poor citizens of the region. Built by Dhaka-based architect Kashef Chowdhury, it was designed to provide an inviting and accessible space for those who use the Centre’s services. This book looks closely at the Centre’s design and construction. Situated on two acres, the complex is designed to blend with the natural environment while echoing the ruins of Mahasthan, a Buddhist dwelling from the third century BC, located nearby. It is constructed and finished primarily of one material—local handmade bricks—and individual pavilions, courtyards, pools, and green spaces are woven throughout. The result, as evidenced in the book’s photographs, by celebrated Swiss architectural photographer Hélène Binet, is a building that is a celebration of essential and simple beauty. founded his Dhaka-based firm URBANA in 1995. He has twice been finalist for the Aga Khan Award for Architecture and has won various other prizes for his work, including the Architectural Review's 2012 Emerging Architecture Award. is the Ware Professor of Architecture at Columbia University’s Graduate School of Architecture, Planning, and Preservation. is a writer, curator, and architect based in London.